In just a couple of weeks, I’ll be kicking back on the North Florida gulf coast. My parents have a place on the Gulf of Mexico, just south of Tallahassee, on the coastline affectionately known as the “Redneck Riviera.” It’s been a retreat since I was 10 years old and many of my best memories have taken place there. Fishing trips with my dad, my mom teaching us how to catch crabs with a piece of twine and a chicken neck, and lazy afternoons spent avoiding the heat by reading book after book in a slowly-swaying hammock was how I spent weekends growing up. Things haven’t changed. When we visit, my dad still wakes us up before daybreak to go fishing, I always bring a stack of books to pass away the hottest part of the day, and while we use a crab trap these days, getting fresh seafood on the table remains a priority. I grew up grouper and red snapper fishing in deep water, but my husband insists on at least one of our fishing trips being in shallow water. Here, while I carefully scan the bottom to make sure we don’t run aground, we cast many a line and usually pull in a couple of good-size speckled trout. Just as the sun starts to beat down a little too hard, we pack up and head home where we dredge the trout in cornmeal and fry it to serve on a crusty baguette for a mid-morning lunch. When the day has not yielded a catch through bad luck or a bad tide, we turn to the shrimp we picked up on the way down to the coast at My Way Seafood in Panacea, FL. A nondescript, cinderblock building set on a lot littered with oyster shells, My Way is the place to buy seafood in this part of the world. Business takes place on the concrete porch where you always find someone with a story, and the time to tell it, sitting atop a well-worn cooler. I never miss an opportunity to take a peek in the refrigerated rooms to check-out the day’s catch and always leave with several pounds of shrimp. 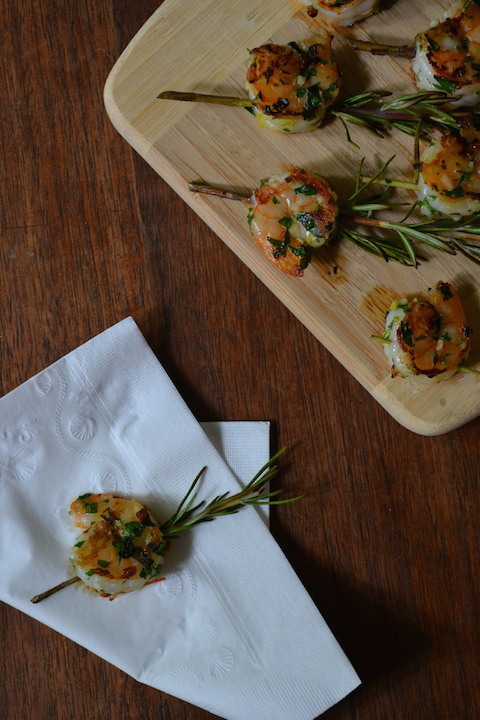 This year, I plan to use some of the shrimp I get from My Way to make these Lemon-Garlic Shrimp on Rosemary Skewers. The recipe requires just minutes to prepare meaning that I won’t have to come inside for long to get these ready for the grill. From there, it’s just a matter of being patient as the smell of fire-kissed rosemary, smoke, and salty marsh gets me ready to pair my gin and tonic with an appetizer of lemon-garlic shrimp. Cheers! For tips on how to purchase, head, peel and devein shrimp, check out my cooking demonstration on the Charlotte Today show. I also provide tips on why I prefer to use lemon zest instead of lemon juice and why canola or vegetable oil is better for the grill than olive oil. Happy cooking! Grilled Lemon-Garlic Shrimp on Rosemary Skewers – Printer Friendly Recipe Serves 10 as an appetizer 2 ¼ lbs (21/30 count) shrimp, peeled and deveined, tails left on Zest from 1 ½ lemons 6 garlic cloves, minced ¼ cup minced fresh flat leaf parsley ¼ cup plus 2 tablespoons olive oil Salt and freshly ground black pepper, to taste Vegetable or canola oil, for brushing grill 24 (4- to 6-inch) rosemary sprigs In a medium bowl, whisk together the lemon zest, garlic, parsley, and olive oil. Add the shrimp to the mixture and toss to coat. Season to taste with salt and pepper. Cover with plastic wrap and refrigerate for at least 30 minutes and up to 1½ hours. While the shrimp marinate, prepare the rosemary sprigs. Remove the leaves from the bottom half of each sprig and set aside. 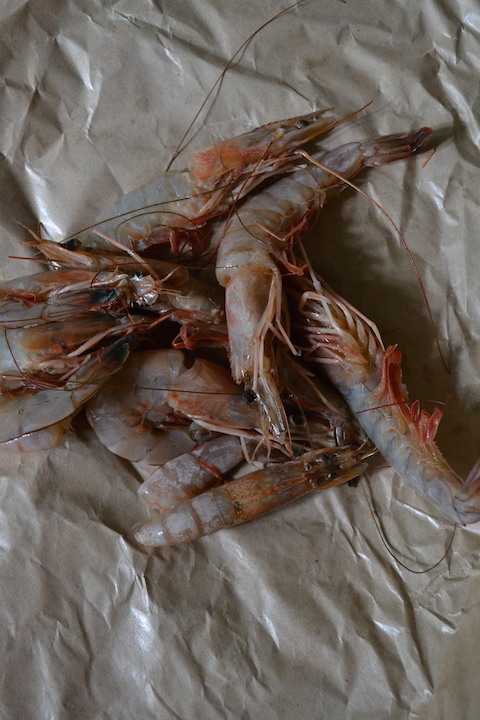 Remove the shrimp from the marinade when ready to cook and thread one to two shrimp on each rosemary sprig. Preheat a grill or grill pan over medium-high heat. Brush the grill with a little oil. Add the shrimp and cook for about 2 minutes on each side until tails are lightly charred and the shrimp are just done. If you find that the rosemary is burning, simply rearrange the shrimp so that the rosemary is on a cooler part of the grill or hanging off the edge of the grill pan when cooking. 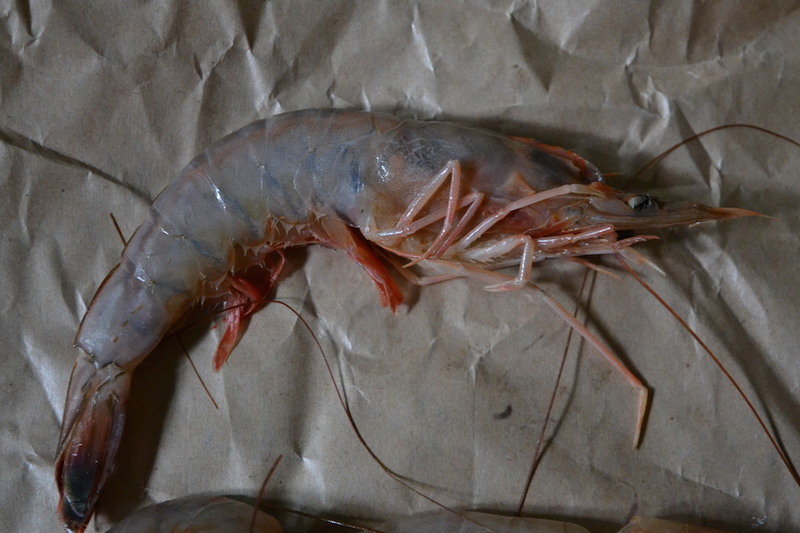 Remove the shrimp from the grill and let cool briefly before serving warm or at room temperature.